A) Choice A, turn and drive down the street then turn across traffic into the Mall? 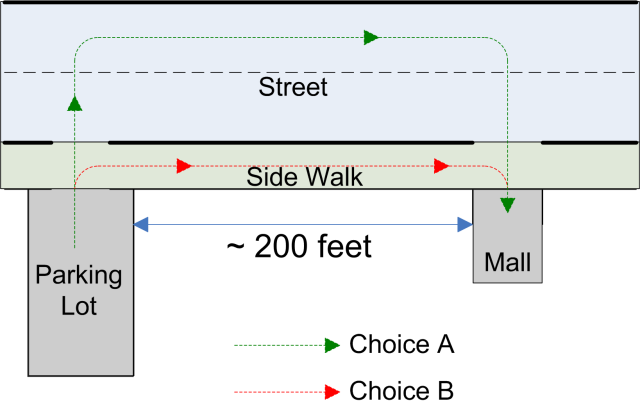 B) Choice B, turn and drive down the sidewalk? Surely the correct, logical and safe answer is choice A. But Bobbie was pulling out of the Mall one day turning left onto the street when she saw a car coming towards her down the sidewalk. Pedestrians and cyclist were moving to the side to let it pass. No one appeared angry or stunned. When the driver reached the Mall the driver waited for Bobbie to turn onto the street and then the driver turned into the Mall. What would you have done? Oh by the way that isn't a Mall entrance it is an exit only.